That’s it for me; it’s the end of summer and I’m returning to the UK this weekend with two new stand-alone novels and a non-fiction book under my belt. It’s been a great period of intensely hard work. Having finished, I was strolling about yesterday and thinking about the strange habits of collectors when I saw this fair taking place. 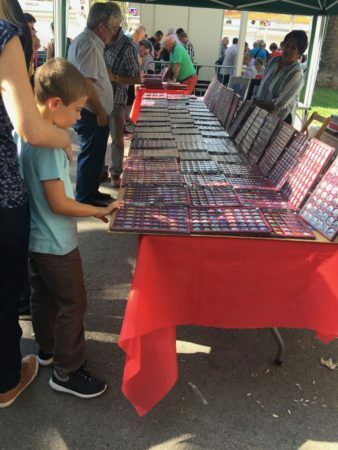 Dozens of stands buying and selling for earnest collectors of all ages. In Europe you seem to find an astonishing array of collecting fairs from numismatics to antique automata. I’ve deliberately low-res-ed the shots here; see if you can guess what they’re collecting. This month sees the biggest paperback collectors’ fair in London taking place, and of course I’ll be there. Prices are rising sharply now (UK mass market editions are finite in supply and therefore getting pricey). I guess just about anything in limited circulation can be collected – last year I attended a typewriter collectors’ fair. Any guesses yet? Answers below please, along with any news of strange collecting habits! I have a friend who appears to be collecting cowboy boots, although she’s still at the stage of “I can’t believe I just bought another pair.” We saw a photo of her stairs with a pair of boots on each step and it was a long flight. I know someone who has ended up with an owl collection because she had two figurines and friends thought she was collecting so everyone gives her owls in various forms. 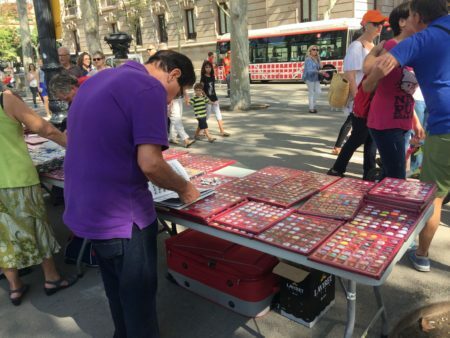 While I like Helen’s idea, I suspect we are in Plaça Reial and might be looking at coins. Are they the metal caps from the tops of champagne and sparkling wine corks? It must be postage stamps. I’m basing that on all the bright colors I see in the second photo and the fact that the guy in the purple shirt seems to be checking a printed catalog or reference book. But I was hesitant to type that because I thought that stamp collecting went out with the black and white TV. But I guess anything is possible…especially in Spain. They are too variously coloured for coins and too shiny and sort of raised for stamps. They definitely look a bit metallic, but I am wondering if they are something really banal that I wouldn’t think anyone would want. But Trace’s idea of bottle tops sounds good, but maybe beer rather than champagne. Definitely a “two biscuit” problem. If we are going to be held to naming them precisely: ‘cava bottle plaques’. I would love them to have been the good old bottle top.. ( Although I do see Trace seems to have the correct answer, according to the world of snowy – never knowingly not knowing ). We have to be careful not to neglect the deviousness of our host, It could be something else entirely. Ha! Trace Turner was indeed correct – they’re the metal cork tops from cava and champagne bottles. Many have heraldic shields on and were issued in limited cuvees. Sad to say I collect those in a small way, myself, although I only keep the tops from Champagne bottles I’ve consumed! My kitchen clock has tops for the hours and in Epernay (Coeur de Champagne) it is easy to find display cabinets for them. There is a (polite) word for collectors but I am pleased to say I have forgotten it! Oh yes and I do also have complete runs of Eagle and Boys World from 63 on. Though all in storage at the moment. Don’t suppose there’s a prize…a bottle of cava seems appropriate, but you might not want to ship it to Florida. I’ll just open one of my own when I get home from work. I too seem to have inadvertently collected a few in various kitchen drawers. 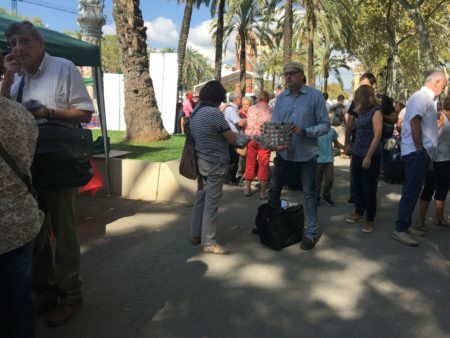 Now to confess – I actually saw that market in Barcelona in April. Coming back this weekend,Chris? Wrap up warmly!